His codename is Inferno, and he is a robot. Created as a prototype for the company Generi-Co, his AI made it to where he didn't always feel the need to fight, so they scrapped his design and began work on a new one. He just sort of walked out of the factory, and no one even noticed. Because he doesn't have a real face he likes to wear masks (of whatever be creative). Usually his masks will have a few holes in them to coincide with some of the holes on his head. 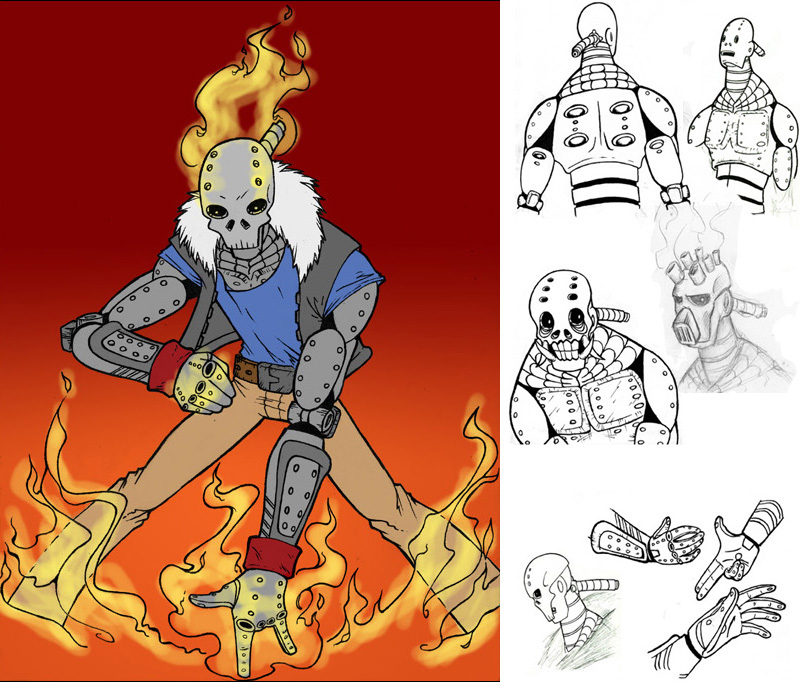 Powers: Generi-Co was experimenting with "powers specific" prototypes and his powers happened to be flame. His body contains special flammible chemicals that he can expell from his body and ignite. All the visible circles on his body are "pores" and he has many more that are not visible. He can coat his body in the chemicals to ignite hiss entire body or do things like shoot out flame balls or constant flames, or whatever. He can also raise the temperature of his body extreemly high without catching fire. So high that he can melt metals and other such things, without melting himself.